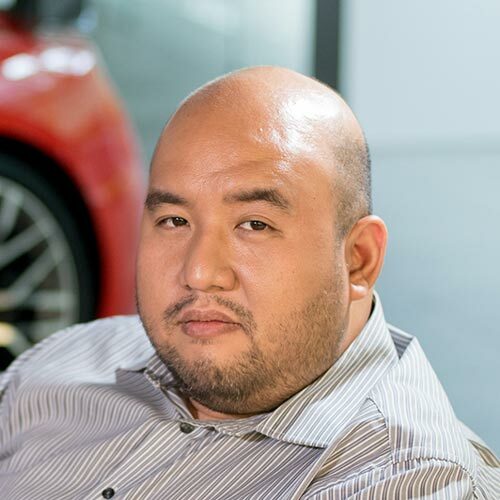 It can be said that Kia made its name in the Philippines on small, affordable cars. One of its earliest offerings, the Pride, was easy on the eyes, reasonably roomy, and best of all, cheap. And that model drew in motorists looking for a dependable city runabout. The Pride became the Picanto, and the tradition of tiny, affordable transport lived on. However the latest version shifted noticeably from its original direction. For one, its design isn’t pleasant anymore, it’s just a little short of stunning. 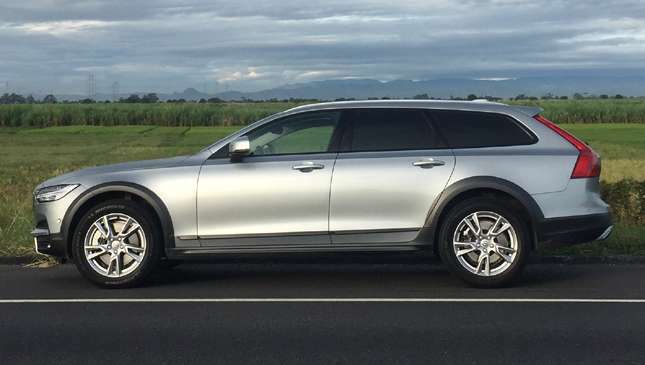 And painfully, the top variant is just a few thousand pesos shy of P800k, well into subcompact territory. Is the new Picanto’s premium-ish price worth it? Let’s find out. It’s already tempting to sign the dotted line based on the design alone—although that’s if you’re staring at the top-spec GT line. The Euro influence from the top (Kia president Peter Schreyer came from Audi) is really showing now, and that’s great. The red accents on the bumper and side skirts are perfect. 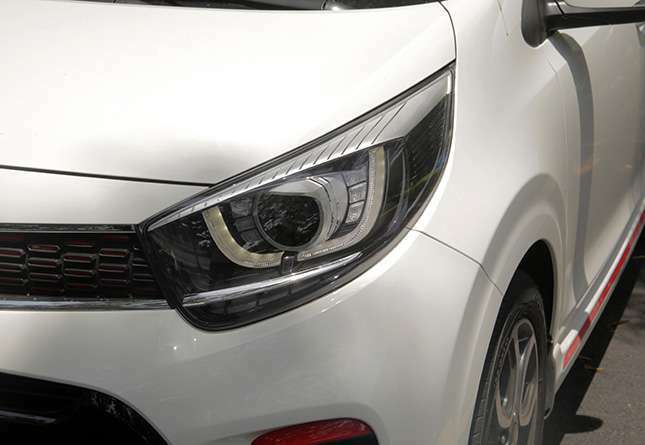 These complement the white paint job, and the brake lights and reflector in the rear complete the Picanto’s wonderful visual symmetry. You stare at Kia’s mini hatchback and you think of turbocharging, a five-speed manual gearbox, and a low steering ratio. That’s how racy it looks. A week into my test drive, I still can’t get over how good-looking the seats are. 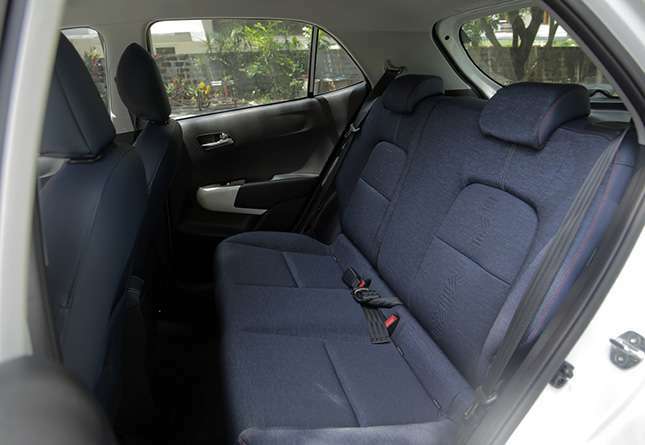 Done in a blue denim-like fabric with red stitching, the Picanto’s cabin reflects the benefit of having a design-oriented leader at the helm of the company. There’s even a glyph design that runs down the center of the seats; it serves no physical function and is purely a design feature. 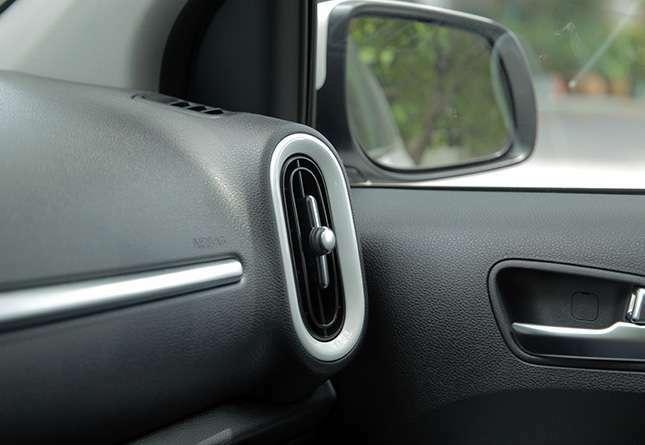 The doors are covered in both the denim-colored fabric and white inserts—the latter matching the side A/C vents. All in all the cabin is simply beautiful. One might think that the plain audio system and the standard climate control switches are a let-down, but their functionality makes up for their plainness. I’d rather have basic that works than something touchscreen that’s picky with what smartphone it’ll work with. I’d upgrade the speakers though, because they sound a little thin. NVH is decent, and the build quality makes me feel optimistic about long-term ownership. Almost. 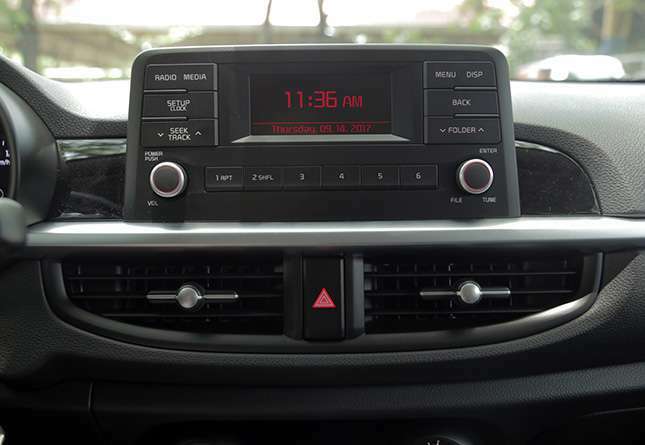 The Picanto’s cupholders are a unique design: You press a button and a half circle springs out, holding smaller drinks in place. The left cupholder in our demo unit stopped working on the second day. We hope that’s just an isolated case. This is where the cold feet might come in. With a naturally aspirated 1.2-liter mill generating 82hp and 121Nm, there’s not much we can expect from this hatchback. And true enough, no thanks to a four-speed automatic transmission, you don’t get much in the way of performance—or just plain athletic driving—either. You have to step hard on the gas to get the car to surge forward, or else some taxi will cut in front of your lane. Once you get going it’s…okay. Perhaps due to the horrid traffic we’ve been getting lately, urban fuel consumption is down to about 6.5km/L. Not what I would call encouraging. The leather steering wheel with white stitching feels good to grip, enhancing the experience considerably. And the Picanto’s diminutive size works to its advantage, lending the car a nimble character once it gets going. But overall the actual driving character is still at odds with its visual bravado. For a small car it handles bad roads with assurance. There were times when a rut hidden in the darkness would upset the suspension, but the occupants are mostly cushioned from the DPWH’s asphalt backlog. 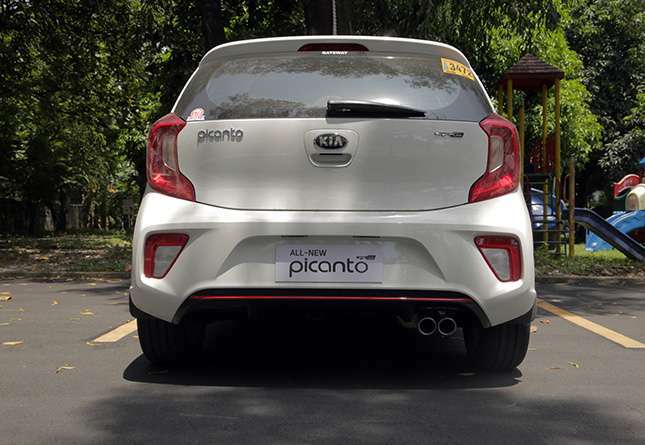 I imagine it must have been very hard for this Philippine Picanto’s product planner to bring this kind of spec in. The 1.2L AT GT is a mishmash of high-end features and a surprising lack of expected functions. You don’t get automatic windows, for example. It would be great to have auto up and down, reasonable to expect auto down, and surprising to get none of the above. The Picanto gets the latter. But you have automatic headlights that activates at night-time. Forget about parking aids or steering wheel buttons. Like I said, some might find the multimedia system too basic, but I like the simple layout. I tried an Android-powered 2-DIN headunit from a Japanese MPV recently, and it couldn’t hold on to a radio station and didn’t want to be friends with my iPhone. 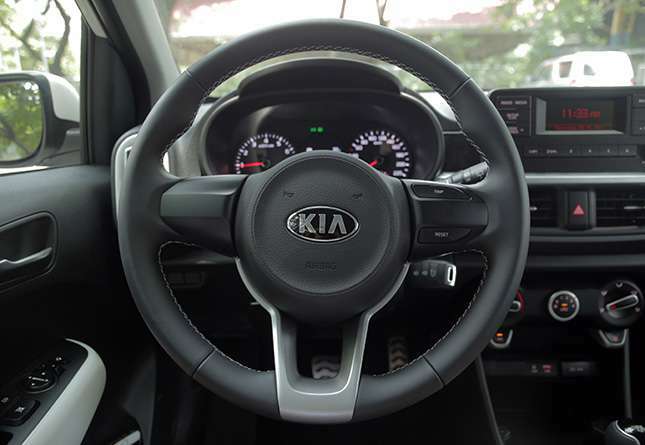 If you like how your car looks inside and out above everything else, and you’re looking for something easy to maneuver, head to your nearest Kia dealership right away. But if driving matters to you, and you want to have a little pep in your drive, then keep looking. A manual transmission might have helped, but the MT variant gets a smaller 1.0-liter engine, so we’re not excited about that either. 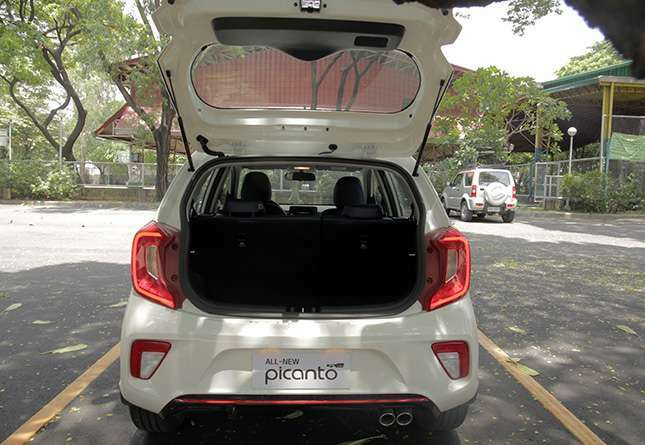 The Picanto isn’t the segment disruptor it could have been, not with this powertrain. But for the design-conscious, and maybe those looking for a stylish second car for the city, it deserves a serious look.